Is anyone else ready to start listening to Christmas music, or is it just me? I don’t know if it’s because it’s been so chilly lately, or because I’ve gotten about 50 catalogs in the mail in the last few days, or because I’ve officially switched from pumpkin spice to peppermint mocha coffee… but I am ready for the holiday season to begin! Bring it on! This recipe was an attempt at making a little more of a dent in the huge amount of ground venison in my freezer! 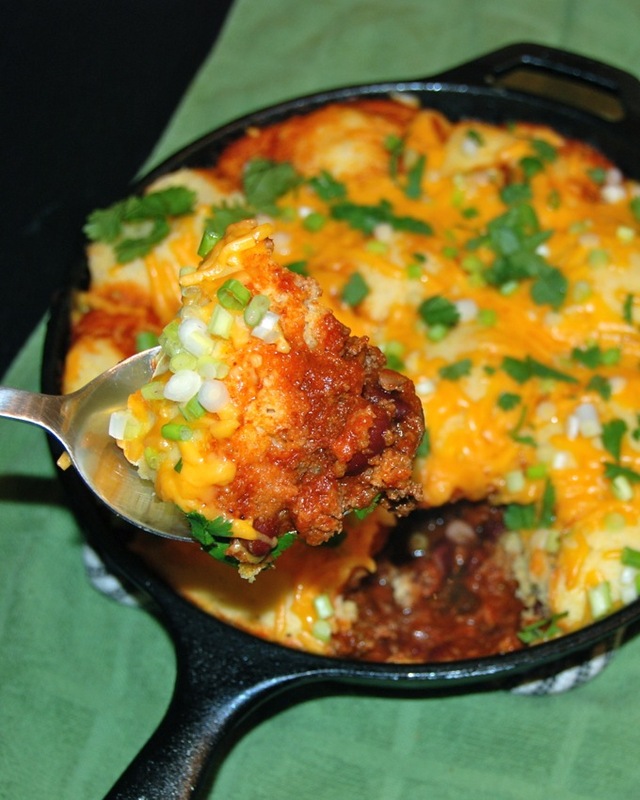 Of course, you could easily use ground beef for this recipe as well. I’d decided to make chili, but wanted to find a new recipe. Nothing on the interwebs was really striking me, so I decided to flip through a few of my cookbooks. 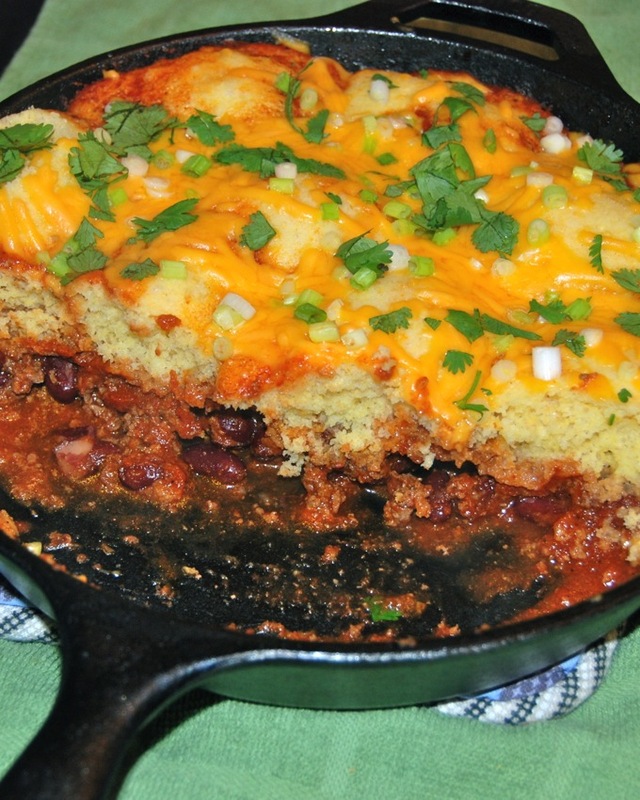 I struck out on chili inspiration, but stumbled upon this Stove-Top Tamale Pie, which not only sounded yummy, but also super easy! It looks like there’s a zillion ingredients, but it’s deceiving. You’ve already got the majority of them in your house and if you want, you can easily sub taco seasoning for all the spices and/or boxed cornbread mix instead of making your own. Brown the meat in large skillet over medium-high heat. Drain excess grease. 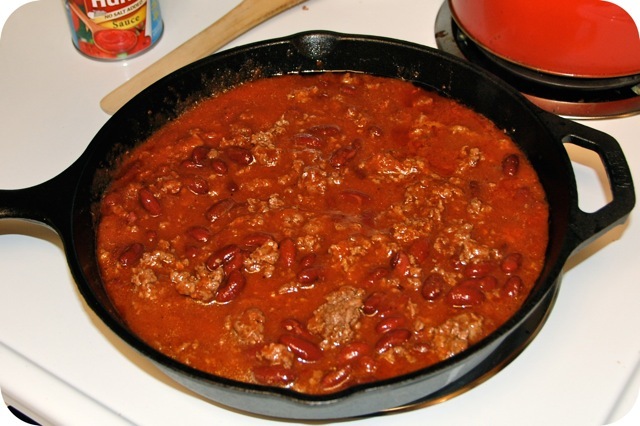 Stir in seasonings chili powder through pepper, tomato sauce, and beans. Bring to boil. Reduce heat to low, cover and simmer 10 minutes. Meanwhile prepare the corn bread topping. In a bowl, combine ingredients flour through milk and mix until just combined. Drop small spoonfuls of batter over meat mixture. Cover and cook on low heat 15 minutes or until corn bread is cooked through. 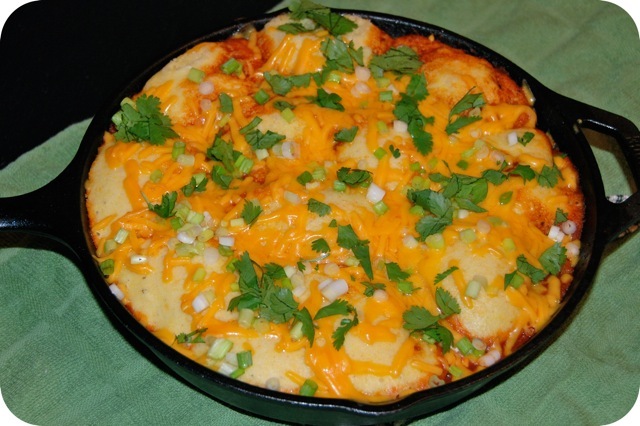 Sprinkle with cheese and green onions. Cover and cook on low heat until cheese is melted. Top with chopped cilantro, if desired. This was super yummy! 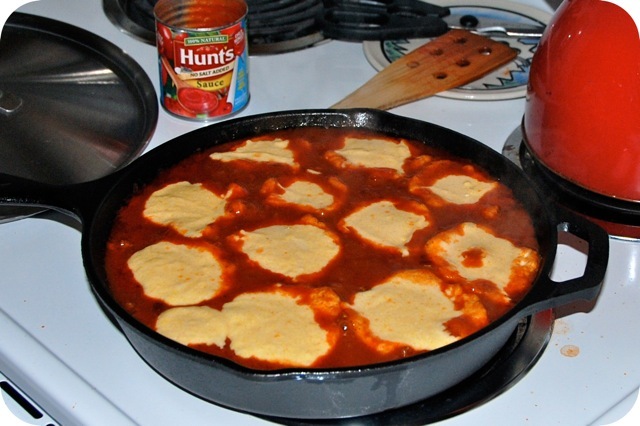 It was basically like a cornbread-topped chili and both Nick and I loved it. It’s probably supposed to be 4 or 6 servings, but, for us… it was three. I think that’s a sign it was a winner! This was delicious!!! We made it tonight with freshly ground cornmeal. Delicious! Love that it is from scratch yet so easy.